We had a great time on our snowmobile trip! There was a about 4 ft of snow so snowmobiling was awesome! It was cold the first day, a high of -5 and then above zero for the next few days which was perfect. Our friends brought the traveling sauna which was so much fun after riding all day. We all had a blast! 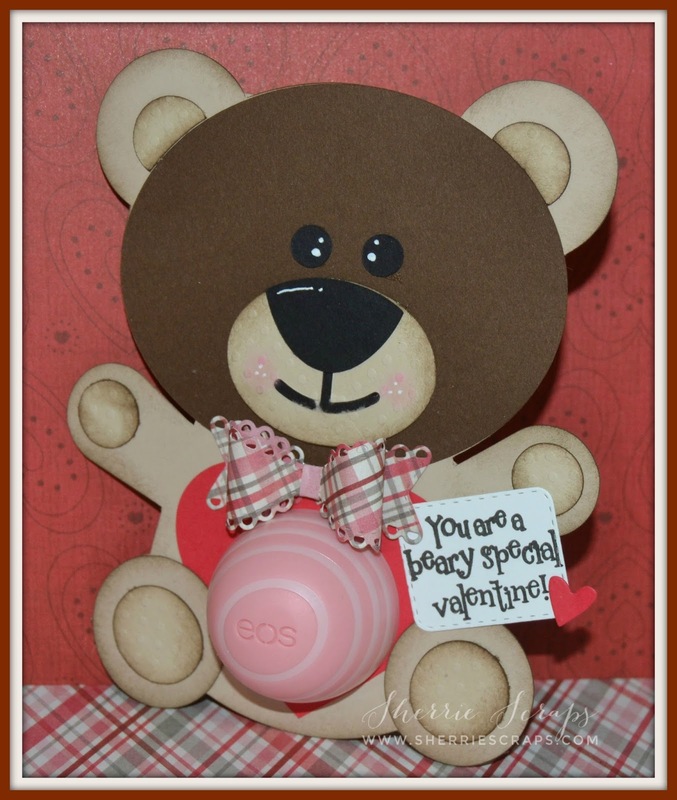 I picked the cute EOS lip balm bear file over at the Silhouette Store #72733 and the stamps and dies are from My Creative Time . I used SU card stock and did a little inking with Tim Holtz walnut stain around the edges of the pieces. The tiny bows are made with My Creative Time's~Fun Size Scallop Stitched Bow die. The little tag is the Square Stitched Goody dies and I stamped the sentiment with I Love You Beary Much stamp set. The tiny little hearts are from the Carved Heart stamp/die set. Oh Sherrie, these are so sweet!! They make me smile!! I love the paper you used for the bow!! It looks amazing!! What a fun gift this is!! Thanks so much for playing along at DL.ART!! These are so super cute, love the EOS lip balms! So sorry about the weather you are having, we have been in the 70s for the last week but will get some rain over the next few days! Oh these are just the cutest! The bow is awesome! What a super sweet project!! Love the pretty bow!!!! Have a great day. Very happy to hear you had fun on your trip. You have created some Beary cute little gifts here. I know the girls will love them. Happy to hear that you had a great time!! I absolutely love your Super cute bears!! saw them on FB and I fell in love with them..lol Cuteness! Hehehe Carri stole my comment about our weather! LOL!! I loveeeeeeee these!! LOVING those adorable bears!!!!!!!!!! Super cute Sherrie! What darling bears! These cards are so cute! I love those adorable bears and the bows are just perfect! Thanks for playing along with us at DL.ART February Linky Challenge! Sounds like a fun trip...and your bears are super sweet!! Okay... I wrote they are adorable! On the WRONG POST! UGH! Your doggy card was super cute But these are ADORABLE! LOVE the sweet bow ties-- That's what happens when you try to look through all the posts you missed and they proceed to leave a comment! LOL Glad you had a great time snowmobiling too! Your trip sounds wonderful! I am loving these sweet little bears. I picked up this little guy a few days ago in the Silhouette Online Store - thanks for the sweet inspiration to get him put together! 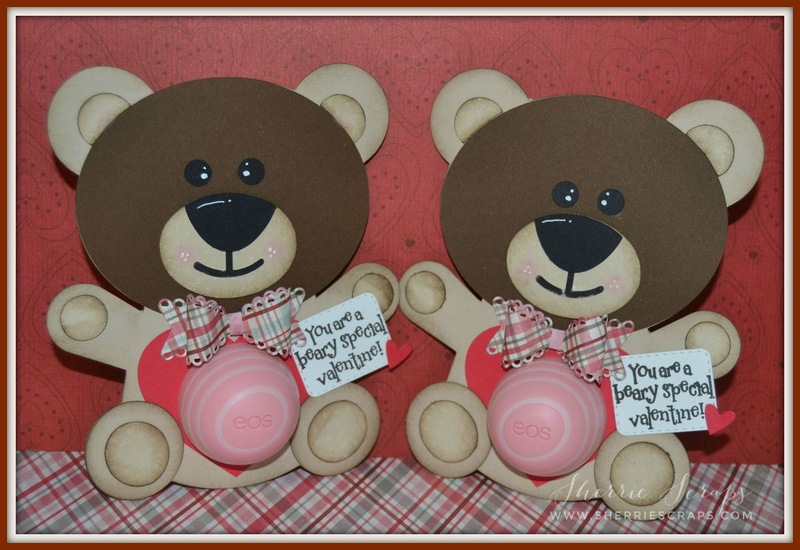 Wow, these are Beary cute! The the eos belly! Looks super cute as the tummy!! Thanks for joining us this week at Die Cuttin' Divas. Oh my gosh these bears are cute Sherrie!!!!! These are so cute, Sherrie! The kids will love them. Thank you for joining us at Die Cuttin' Divas this week! Oh so cute, I love this little teddy :) So sweet my friend! So sweet! It certainly is the season for dry lips. These are such great gift ideas! Love the adorable bows on your bears! So glad you enjoyed your snowmobile trip. I've never heard of a portable sauna - but it certainly would make a cold winter day a bit more enjoyable! Darling little 'chappie' cards...I am sure they were a big hit! Thanks for sharing you wonderful inspiration with us at Silhouette Challenges #34! Super cute teddy with a wonderful gift. How perfect! Thank you for joining our “Kid’s Theme” Challenge this week at Die Cuttin’ Divas.